Find wide range of high-quality, coach hire services in London England. Private coach hire company in London. Fleet of more than 50 vehicles, comprehensive range of ground transport solutions, suitable for any event – private hire, corporate hire, group travel, day excursions, school run etc. Kangley Bridge Road, Lower Sydenham, London SE26 5AT, England, UK. A family run coach hire & minibus hire company in London. Offers Airport Transfers Coach Hire, Business & Corporate Coach Hire, Days Out Coach Hire, School Coach Hire, Shopping Trip Coach Hire, UK Coach Tours Coach Hire, Wedding Coach Hire etc. 16 Seater Minibus, 16 Seater Executive Minibus, 29 Seater Executive Coach, 29 Seater Coach Hire, 37 Seater Executive Coach, 39 Seater Coach, 43 Seater Coach, 50 Seater Coach and 57 Seater Coach. Retro Bus is a leading events and classic transportation company in London. Providing the finest quality traditional London buses to hire for your Wedding, Corporate Event, Private Event or for TV, Film or Promotional Purposes. One of the best affordable prices Coach / Minibus hire companies in London. The fleets include 8 seater minibus 10 seater minibus 12 seater minibus 14 seater minibus 16 seater minibus 24 seater minibus. London’s Top Ten Attraction you can visit with “London Minibus Hire” – The One and Only Big Ben, London’s Vibrant Piccadilly Circus, London’s Tower Bridge, London’s Big Wheel ”London Eye”, London’s Houses of Parliament, London’s Buckingham Palace, London’s Tower of London, London’s Trafalgar Square, London’s St. Paul’s Cathedral and London’s Hyde Park. Camberwell Green, London SE5 7BJ, England. Offers London cheap coach hire and mini bus hire services. Including London Airport transfer, executive coach hire, London coach tour, mini coach hire etc. Fleets include 8/10/12/14/16 seater minibus and 36 Seater Coach. Airport, Train and Boat Transfers, School Trips, Day Excursions etc. 58 Luxury Fleet of Coaches, 49 & 53 Seat Executive Coaches. All UK and Continental Coach Hire available. Bus tour agency in London, England. Coach Hire Company London offers 8, 16, 25, 32, 49, 53 and 57 seat coaches for hire with smart, uniformed and knowledgeable drivers. Coach and minibus services for small or large groups of people for a wide range of occasions including airport, port or station transfers, special events, leisure travel, weddings, for educational or business purposes. Double Decker Bus Hire (Including Red London Buses) for Wedding, Hen Night, Birthday, Sightseeing and Corporate Events. COACH, MINIBUS & HUMMER LIMO HIRE for transfers in London or to Airports. One of the UK’s leading coach hire and minibus hire companies. Coach hire company with a fleet of coaches ranging from 14 to 57 seater coaches with various facilities on request. Over 90 years of experience. Services are Airport Transfer, Sporting Events, Private Hire, School Trips, Stag and Hen, Theatre Trips and Weddings. With over 30 years of coach hire experience. Services are coach hire, corporate coach hire, executive coach hire, school coach services, double decker coach hire, tour operator services and mini coach hire. Luxury Coach Hire in London and the South East. Local coach operator situated in South West London. Supplying transport for Local Schools, Executive and Corporate Coach Hire for Every Requirement, Teams and Private Hires alike. Unit 7a Rainbow Industrial Estate London, United Kingdom. Provide Coach and Minibus Hire throughout the UK at fair price. Services are Corporate Coach Hire, Daytrips, School Coach Hire, Airport Transfers, Weddings, Stag and Hen, European Travel (Mainland Europe) etc. Providing first class coach travel, transfers for individuals or groups, luxury travel, sightseeing and excursions, coach & minibus hire services etc. Offer services in different Languages including Portuguese, Spanish, English, Italian and Russian. 5 Percy Street, Suite 2, London W1T 1DG, United Kingdom. London coach hiring service offers corporate coach hire, airport shuttles, wedding coach hire, private coach hire, sports coach hire, minibus hire, West End luxury coach hire, East London coach hire and Take a Day Trip near London. 86 Paul Street 3rd Floor, London, EC2A 4NE, United Kingdom. Est. 1918, offer a modern fleet of air-conditioned, executive Mercedes coaches and mini coaches. 8, 12, 16,19, 25, 35 and 53 seater vehicles. 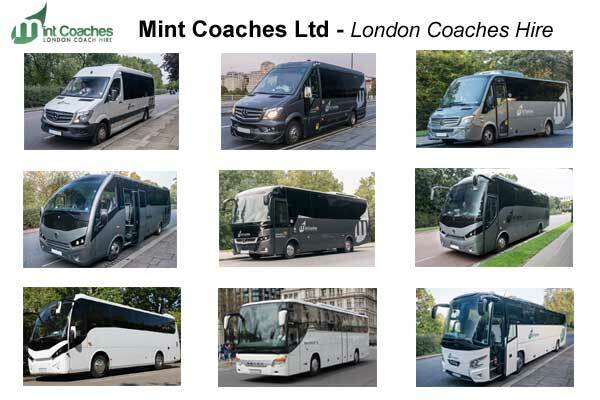 London based unbranded white coach hire company offering a professional coach hire and minibus hire service for group travel, corporate hire, private hire, sporting event care hire, short / long distance travel, airport transfer, London full day / half day excursions, sightseeing tours etc. Coach hire company in London UK. BM Coaches London based charter bus service in Hounslow, United Kingdom. Offering luxury mini coach hire service, Luxury Midi Coaches, Luxury Full Size Coaches, Airport transfers etc. Page updated : 4 April, 2018.